Originally a fishing village and enclave for Italian immigrants, Little Itayl, a hilly community by the harbor, has retained its heritage while revitalizing the downtown area with restaurants, retail and residences. The community is also becoming more Italian again, with a recent influx of immigrants. 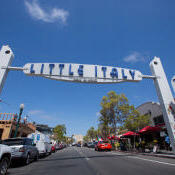 From the 19th century until the 1970s, Little Italy made San Diego the center of the U.S. tuna industry. When the canneries relocated and part of Little Italy was demolished to build Interstate 5, the area went into decline. However, in the 1990s, the neighborhood began its revitalization. Many of Little Italy's 500 businesses are on India Street, but nearby Kettner and Columbia streets are also popular for businesses. The area has weathered the recession well, never incurring any vacancies on India Street, and has a low crime rate compared with other neighborhoods nearby. Until the 1970s, business in Little Italy was primarily tuna-related and residents were mainly of Italian heritage. At one point, more than 6,000 Italian families lived in Little Italy and the area became known for its authentic restaurants. Since then, the area has been gentrified and made the transition from a working-class immigrant neighborhood to a young, hip downtown area. Originally a fishing village and enclave for Italian immigrants, Little Italy, a hilly community by the harbor, has retained its heritage while revitalizing the downtown area with restaurants, retail and residences. The community is also becoming more Italian again, with a recent influx of immigrants.